Regulatory B cells (Bregs) suppress immune response via the provision of IL-10. Due to the phenotypic heterogeneity of described Bregs, it is important to have standardized protocols for their isolation and identification. 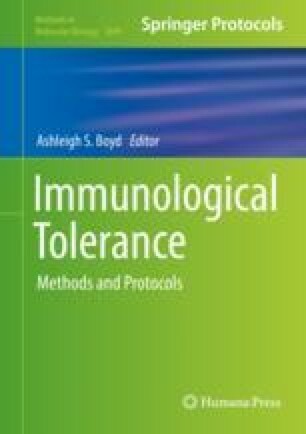 Previous work by our laboratory has shown that the immature B-cell populations in the murine spleen and human peripheral blood produce the highest levels of IL-10 on engagement of CD40, and can suppress pro-inflammatory T-cell differentiation. In this chapter, we describe the methods necessary for the isolation of this subset of Bregs and their activation via CD40 in vitro. Madhvi Menon and Elizabeth C. Rosser contributed equally to this work. We would like to thank Dr. Paul Blair for his constructive criticism of the manuscript. Madhvi Menon is funded by a Wellcome Trust PhD studentship (090406/Z/09/Z). Elizabeth C. Rosser was funded by an Arthritis Research UK PhD studentship (MP/19314).